As the world absorbs the opening of the Beijing 2008 Olympics, the organisers of the 2012 games in London say that they can easily match anything that the Chinese have so far been able to demonstrate. "Certainly the opening days have impressed many, but they have only had one stabbing in their first twenty-four hours," said Lord Steven Billingsworth from the 2012 committee. "That single stabbing, even in the historic setting of the Drum Tower will be nothing. Our preliminary opening ceremony plans alone have 31 fatal stabbings." Details are still far from being finalised, since there has yet to be a final decision as to whether or not shootings will also be included in the Olympic ceremony. However the organisers plan to take a leaf out of China’s book when it comes to portraying Britain’s foremost position in world history. The 2012 team says that London is uniquely placed to host a show of such magnitude not only as a showcase for sporting excellence but also as a genuine human spectacle. "The Olympic ideals are expressed through normal London life, the pickpockets are swifter, the drug addicts higher and the bad language stronger than anywhere else in the world," explained Lord Billingsworth. "A ten minute walk, assuming you survive, around South East London shows all of human drama in all of it’s multicoloured facets. It’s all there, from the green faces of the crack addicts to the blue faces of battered women being strangled and the red pools of blood outside night-clubs." His lordship was one of several members of the 2012 organising committee who were today showcasing a new range of branded safety equipment that will be available to visitors and competitors alike. 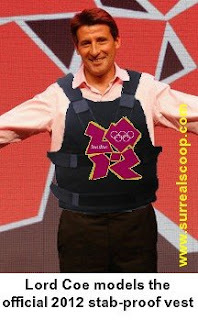 "Well, they are a little bulky," admitted Lord Coe. "But we expect the need to actually wear a stab-proof vest will motivate marathon runners to overcome its weight and set a world record time through the streets of London."